There’s no excuse to put off movie night anymore. These days, there are rentals from your cable, satellite or FiOS provider, DVDs and Blue-ray discs available through the mail—and now, a variety of online rental services. Contrary to what you might believe, online rentals don’t require hooking your computer up to your TV. There are a number of set-top boxes dedicated to this, and the equipment you already have may be capable of video rentals. 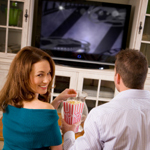 TiVo and other DVRs, video game consoles, Blu-ray disc players and even some TVs themselves allow you to rent movies if they can connect to the Internet. If you’re renting, the video is sent down bit by bit, or streamed, so you can’t save a copy. If you buy, the movies or TV shows are stored permanently on your device. In most cases, the rental prices are cheaper than what you'd find at a rental store and there are no late or restocking fees, but rentals usually expire 24 hours after you start viewing the movie. Once you've hooked up the device you’re going to use to your TV and set up your account information, renting videos is a snap. Most services offer an on-screen menu of titles with "box" shots, descriptions, and ratings. You just use your remote to pick a movie and wait for it to start. Depending on the service, and the strength of your broadband connection, most movies begin in just a couple of minutes. So, you may be wondering, "If it's that simple, then why do we still have discs?" Well, first off, not everyone has broadband access in their living room. These services generally work best with a wired connection, as Wi-fi can be too unreliable for the large amounts of data involved in high quality video moving to your rental device. Secondly, the online selection may not be as big as your video store and sometimes new releases aren't available as early as they are on disc. Finally, the picture quality, while good, isn't as good as the actual disc versions. Standard-definition streamed movies don't look as good as DVDs, and high-definition streams don't nearly rival their Blu-ray counterparts. However, if convenience is what you're looking for, then these products and services are sure to please. Roku Digital Video Player ($99) Access to Amazon Video on Demand and Netflix. Apple TV ($229 for 40GB, $329 for 160GB version) Stream standard or high definition movies and TV shows from iTunes or play your saved iTunes collection on your computer through the device. vudu ($149) vudu is an all high-defintion streaming box. The rental library contains over 13,000 titles and includes new releases the same day they become available on DVD. Movies go for $3.99 to $5.99 with no monthly fee. Out of the box, it requires a wired Ethernet hookup, but a wireless kit is available for $79. There are several Blu-ray players currently available that, via their Ethernet connection and an onboard application, allow you to access the Netflix library. Check out the LG’s BD370 (wired) and BD390 (wireless) models. They range in price from $299 to $399. 2Wire MediaPoint Digital Media Player ($99 includes 25 movie rentals) The MediaPoint player works with BlockBuster’s OnDemand service. The Internet connection can be either wired or wireless. TiVo (Series 2, 3, HD and HD XL $149 -$599) This DVR now gives you access to Netflix, Amazon Video on Demand, CinemaNow, and Blockbuster (forthcoming) online movie libraries. PlayStation 3 ($399) Through the PS3’s online store you can both rent and purchase TV shows and movies (as well as PlayStation games) in standard or high definition. The selection isn’t as extensive as Netflix but it does include many current releases. Movie rentals cost $2.99 -$5.99 and movie purchases (which get stored on the console’s hard drive) go for $9.99 - $14.99. Microsoft Xbox 360 Pro ($299) This video game system works with Netflix, Roxio CinemaNow, and Blockbuster (forthcoming) video services. In addition to your account with the video rental service, you must be an Xbox LIVE Gold member ($49.99/year).